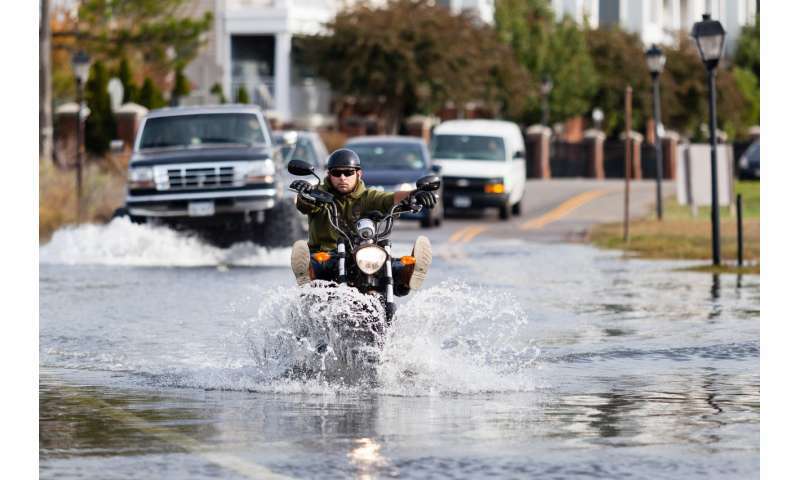 Hampton Roads has one of the highest rates of relative sea level rise—the combined effects of sinking land and rising seas—along the U.S. East Coast, about an inch (23 millimeters) every five years. It has experienced a steady and dramatic increase in high-tide flooding over the last 90 years. Accurate, local subsidence maps are necessary for the area to prepare for increasing flood risks in the future. The region comprises seven Virginia cities, including Norfolk and Virginia Beach, as well as Naval Station Norfolk, the country's largest naval base. Researchers from NASA's Jet Propulsion Laboratory in Pasadena, California, and Old Dominion University (ODU) in Norfolk found the variations in subsidence by analyzing synthetic aperture radar (SAR) images acquired between 2007 and 2011 by the Japan Aerospace Exploration Agency's ALOS-1 satellite. Processing the data with state-of-the-art image processing techniques, the researchers were able to document how the land surface had changed from the time of the first ALOS-1 image to 2011. To tie in that relative data set with existing, lower-resolution maps of earlier subsidence, as well as to put the results into a framework already familiar to decision-makers, the researchers developed a new strategy to integrate the processed SAR measurements with Global Positioning System (GPS) observations. The ALOS-1 data set used in this study is relatively small, with the satellite acquiring an image of the area only once every 46 days at best. Bekaert and coauthors look forward to using data from the future NASA-Indian Space Research Organizaton Synthetic Aperture Radar (NISAR) mission, scheduled to launch in 2021, and from the European Space Agency's Sentinel-1 constellation, which currently acquires a new image of the Hampton Roads area every 12 days. NISAR will also acquire an image every 12 days, but because of its longer operating wavelength and higher resolution, it is well placed to extend subsidence mapping into more challenging rural areas and wetlands. "Continuing, regularly acquired SAR data will allow us to reduce the uncertainty in our subsidence rate estimates, which is important for decision-making," Bekaert said. Coauthor Ben Hamlington (ODU) noted, "Information regarding subsidence should be incorporated into land use decisions and taken into consideration for future planning." He has presented preliminary findings from this study to several planning and emergency management committees in Hampton Roads. Hamlington said, "We had a need for high-resolution images of subsidence, but we didn't have the expertise and technology to do the analysis ourselves here at ODU. Collaborating with JPL helped us build capacity for the future, and also get immediate results." The paper in Scientific Reports is titled "Spaceborne Synthetic Aperture Radar Survey of Subsidence in Hampton Roads, Virginia (USA)."